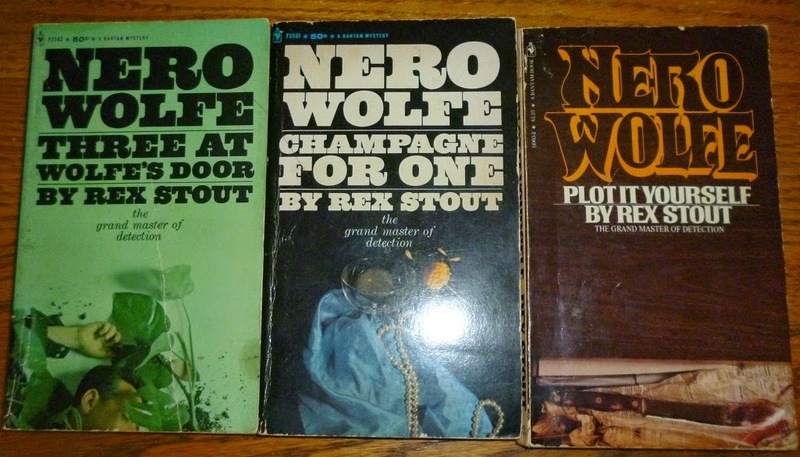 This is the seventh installment of the Nero Wolfe Project. Today, we're looking at Champagne For One, Plot It Yourself, Three At Wolfe's Door, Too Many Clients, and The Final Deduction. In Champagne For One, Archie is called to fill in for an associate of a former client, who runs a charity house for unwed mothers. He volunteers to be a companion to one carefully selected female--presumably to get them acclaimed to normal life. When one of the young ladies dies of poison, it's written off as a suicide, since she had kept poison in her purse and bragged frequently and recently about taking her own life. Archie, ever the detective, had been notified to this effect, and so had been keeping an eye on her--and knew that there was no way she had committed suicide. Since Inspector Cramer knows full well they can't dismiss Archie's statement, they have to hold off on declaring that it's murder--and so Wolfe has to go along to solve the murder by revealing secrets and going through the motions of that night. It's a solid story, but the most notable thing about this book is the emergence of Fritz. Fritz! Obviously, he's always been a part of Wolfe's stories, much more than Theodore, but in this book Archie and Fritz have several long conversations, and Fritz openly talks about getting clients. It's refreshingly different and reads like something that should have happened from the beginning, because the dialogue is downright awesome. Plot It Yourself details a group of publishers and writers of varying sorts who are being blackmailed. Several writers are claiming plagiarism against major successful writers, and old copies of their submitted manuscripts are somehow showing up on the premises--obvious plants, but no one can prove it and so settlements are made. After the fourth one, the committee approaches Wolfe to make it stop. After some research on the manuscripts, Wolfe tries to back out since it becomes hopeless, but one member suggests offering one of the accusers a modest sum to spill the beans, and several members chip in. When Wolfe agrees, Archie approaches each one...only to find each one murdered just as he gets there. Again, we're treated to an active Fritz in this book, and the mystery is unique enough that this story stands out. There's also some amazing comic relief--Archie showing up to each victim just as Stebbins does, and they both give increasingly disgusted looks at each other. Three At Wolfe's Door: Includes Poison a la Carte, Method Three for Murder, and The Rodeo Murder. In Poison a la Carte, a fancy dinner is served for a group of gourmet enthusiasts, who call themselves Aristologists. When one of their number is poisoned, the actresses hired as servers come under suspicion and inquiry, since the order in which the dishes were served makes a difference. It's a solid story--and Archie gets to keep his hormones in check with so many actresses--but otherwise forgettable. Method Three For Murder starts off with Archie quitting, and as soon as he steps outside he runs into a client. The client has a dead body in her cab, which she's borrowed in a bid to confront her estranged husband. An interesting story, with perhaps a little bit too much time dealing with the "Archie quits and so whose client is it really" aspect. In The Rodeo Murder, a rodeo being held in New York (and Lily Rowan hosting the festivities) brings a bunch of cowboys within Archie's purview. One of the rodeo contestants is at a disadvantage when his usual rope goes missing--which, of course, ends up around the neck of a rival. Lily hires Wolfe to resolve the murder since it took place at her place, and Wolfe manages to piece it all together. It's a pretty solid story which could have easily devovled into making fun of the rubes out in Texas, but handles a good number of red herrings, motives, and opportunities to be a good story. Too Many Clients: A rich director of a plastics company comes to Wolfe to see if they can tell if he's being followed, giving Archie an address in a seedy part of the neighborhood. When the director doesn't show, and turns up dead, Wolfe and Archie realize that the person who came to them wasn't the director at all; just someone pretending to be him. They then discover that the reason the location was given is that it's the second home of the director where he entertains guests of the female persuasion. They hire Fred to stay in the apartment (and Archie strikes up a friendship with the Puerto Rican couple who run the building), and as each of the director's lady friends show up to get their belongings, Fred catches them and they all approach Wolfe, independent of one another, to hire him to help keep everything a secret. Several threads come through this mystery--the landlord's daughter turns up dead and was blackmailing one of the women; Archie and Wolfe try and keep the room a secret from the police, since it's their only way to keep getting the info they need and identify the director's guests; the conflict between the company and the widow, both of whom want Wolfe to decide things in their favor; and so on. One of the better books, and the subject matter is refreshingly mature yet handled decently. The Final Deduction: The rich wife of an actor approaches Wolfe; her husband has been kidnapped, and she wants Wolfe to handle it to make sure he comes home safe. After he is, the assistant of the family is found dead, and Wolfe knows that she was somehow involved in the kidnapping. When, as per the terms of his engagement, he won't reveal the details of the kidnapping until a time limit is set, Archie and Wolfe try and dodge making any statements to the police. When the husband winds up dead anyway (and the police suspect it was an accident), the widow turns against Wolfe who knows it is murder. Another decent story, although the resolution of the murderer is a little weak.